Quantum is a gorgeous, striking gelding that is ready to bring his new owner accolades in the Dressage arena. 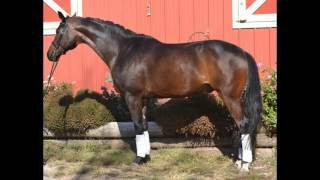 His bloodlines combine the flashy Quaterback with the proven Weltmeyer to create an athletic package with a fantastic walk and canter. He is schooling third level and will quickly progress into a spectacular FEI horse. He is easy to be around with no quirks except an insatiable appetite for cookies. ;) This personal guy will make you smile when you ride him!